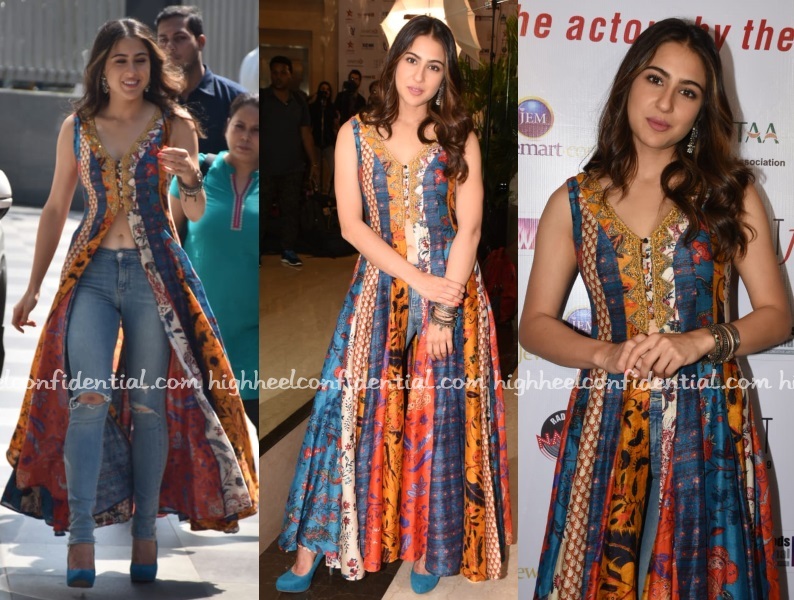 Sara attended an event on Friday wearing a Ritu Kumar paneled maxi with denims and suede pumps. I think wide legged palazzos and light strappy sandals would’ve been a better option here. Dont’ like this with the denim pants at all. I agree that it would look better with palazzos. Can I just say I’ve become a big fan of Sara fashion wise. I love love love every outfit she wears and is perhaps the one one I would love to raid the wardrobe of (after losing a few lbs myself haha). I love her sense of dressing and this outing is no exception. Jeans gives this a trendy look..palazzo would have been more traditional. She gives me true fashion goals. What a fashionista! Imo, she beats the permanently couture clad brigade of sonam, anushka, dp, kkk etc anyday. Spot on. Palazzos would have looked nice. Sara, girl, enough with that head cocking. Wide legged palazzos with flared kurta? Me thinks that would not work. It would be uncomfortable and might seem like too much fabric imo. I don’t mind the denim pairing here but not a fan of the kurta itself. Shoes are terrible. Madhuri has the same hairstyle. Then why Madhuri’s hair become 90s and Sara’s become trendy? The maxi is too bad for normal mortals and only a Diana Penty can make it cool. Pallazos would be too weird here. But yeah, strappy sandals might be nice.